Robert Redford’s final role before his reported retirement as an actor is a wry, understated affair – not unlike the actor himself. Review by Patrick Compton (7/10). Robert Redford’s somewhat bloodless handsomeness has been writ large on the silver screen for more than 50 years since his debut in Situation Hopeless, But Not Serious (1965). Now it has all come to an end in this pleasant crime caper film in which the 82-year-old legend plays Forrest Tucker, a “pistol-packing grandpa” who has a thing for conducting civilised bank heists in which not a drop of blood is spilt. 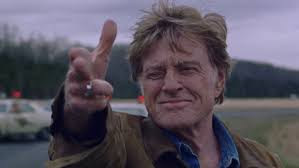 This is a fact-based movie, scripted and directed by David Lowery (A Ghost Story) in which Redford plays Tucker as a man who gets his kicks from robbing banks using charm rather than bullets, and, as we later learn, also enjoys escaping from the many jails in which he’s been incarcerated. Some of the movie best scenes take place with Tucker and his two sidekicks (dubbed the “over the hill gang”), memorably played by Danny Glover and Tom Waits, as they natter about this and that, with none of them particularly interested in the money they steal. There is a romantic interest of sorts for Redford, a glowing sunset of a performance from a wholesome Sissy Spacek who lives alone on her horse farm. But even her allure is not enough to capture Tucker’s undivided attention for long before he is forced to scratch his criminal itch. The detective reluctantly trying to nail them is played by Casey Affleck who characteristically mumbles his way through his part as a cop who is tired of his job and would probably like to retire to his sofa in the family home. There’s also a poignant cameo from Elizabeth Moss (The Handmaid’s Tale) who delivers a moving little speech about her non-existent relationship with her dad (Tucker). The story itself is a shaggy dog affair, nicely directed and elegantly written with a nostalgic jazzy soundtrack. Redford’s charm, thin as it has sometimes been, has always been his calling card, with The Sting, Butch Cassidy and the Sundance Kid and Out of Africa arguably his best efforts to go with his arguably even more impressive achievements as a director (Ordinary People, A River Runs Through It and Quiz Show). The thing about Redford as an actor, though, is that he has always withheld an important part of himself from the audience, a restraint that somehow resists exploration. His performance as Tucker, a gentleman criminal who conceals his deepest feelings, is fully in line with this image.